I, for one, can think of nothing more romantic to do this Valentine’s Day evening than watch the New York Knicks and Toronto Raptors. Valentine’s Day is about love, and love is about communication, and the New York Knicks, for the first time this season, are running an offense in which the players are really, truly speaking to one another with their play. During the opening few weeks of the season, the Knicks played offense like a bunch of Quaalude addicts looking for an emergency exit in a dark movie theater. They just sort of bumped into each other and knocked over people’s popcorn. The biggest issue, as we all know now, was the lack of a point guard who ran coach Mike D’Antoni’s (once critically acclaimed, then denigrated, and now celebrated again) offensive system. To see Jeremy Lin run these sets — always threatening with penetration, spacing out the floor, concentrating as much the roll as the pick — is to see D’Antoni’s offense in full flight. As has been mentioned quite a bit, this Knicks-Lin renaissance has taken place while the Knicks’ two stars, Carmelo Anthony and Amare Stoudemire, have been absent from the team (Melo, due to injury and Amare, due to the death of his brother). 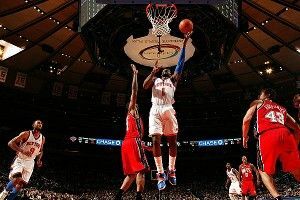 Amare is expected to return Tuesday night. If Lin’s ability to run the pick-and-roll with Tyson Chandler is any evidence, he and Amare should hit it off like Erick Sermon and Parrish Smith. Here’s the real question: What happens when Anthony comes back? While he has played heroically through several different nicks, knocks, and injuries, Anthony has struggled to excel within the D’Antoni system this season. If the Knicks offense was like car traffic, Anthony was the Big Dig. (Sorry for blasphemously making a Boston reference in a New York sports blog post.) (Did they ever finish that thing?) When the ball came to him, everything ground to a halt. It’s doubtful that simply playing with Lin will change Carmelo’s, shall we say, meditative habit of holding on to the ball. But don’t underestimate Anthony’s basketball intelligence or his desire to win. And besides, he sounds elated at the prospect of playing with Lin. Roy Hibbert and the Pacers to roll out the red carpet for the Heat. Also, try checking out the Thunder and Jazz.